Too much mulch applied over the root ball or resting against the trunk (see right photos) can cause problems for trees, especially when there is a lagre range in particle sizes. Roots often grow up and into the mulch causing stem girdling roots which can kill trees (lower photo). This is especially troublesome on trees planted within the last 10 to 20 years. In addition to causing problems described below, mulch can also hide decay and dead spots on the lower trunk and major roots. Decay in this portion of the tree can cause the tree to become unstable. Keep mulch about 12 to 18 inches from the trunk for any size of tree. 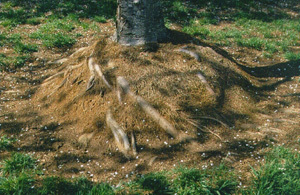 Mulch should not be piled against the trunk (above) because roots may grow there (below) and girdle the trunk.